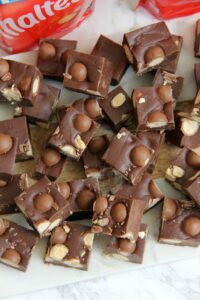 Easy Condensed Milk Malt Chocolate Fudge full of Maltesers. Quick, Delicious, No Sugar Thermometers. 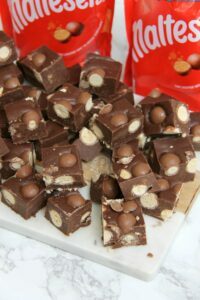 My favourite Malteser Fudge recipe! So like, its obvious that I like Fudge. I can’t keep up with the amount of Recipes I have on my blog for it now! I have all sorts like Mars Bar Fudge, Speculoos/Biscoff Cookie Butter Fudge and Honeycomb Crunchie Fudge to name a few. Honestly, I LOVE IT. I have always based it off of a recipe from Carnation but have adapted them to make them flavoured, and themed! For most of them, I like to use a little bit of butter to give it a yummy taste, but its not always necessary. 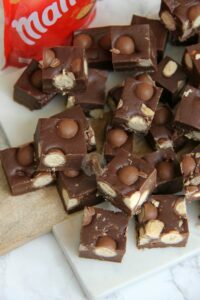 You can also make condensed milk fudge without Icing Sugar for example, but I much prefer it with. 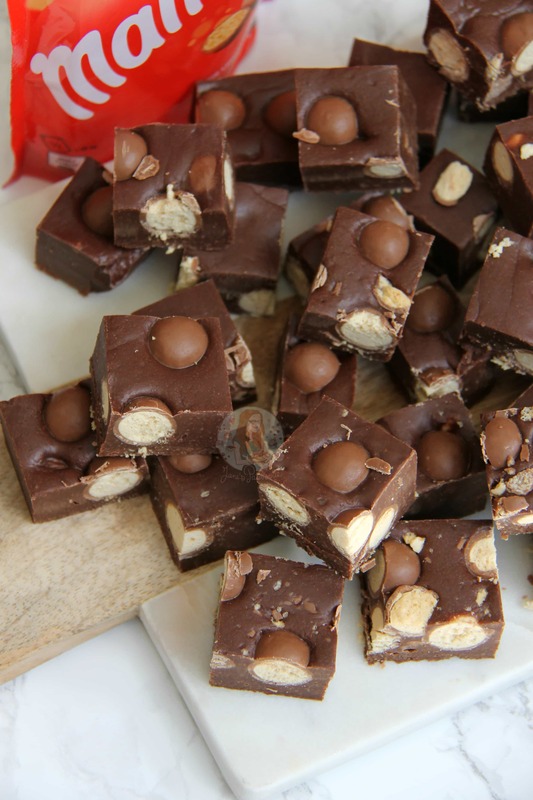 I find it helps set the fudge better, gives it that bit of extra sweetness, and its so yummy! 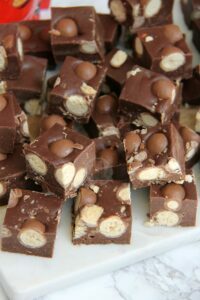 For this fudge I decided to use Dark and Milk Chocolate, but you can easily just use Milk, or just use Dark for example! I often find that using Dark Chocolate helps it set SO much better than Milk, or White, but the quantity of 400g to a tin of condensed milk is perfect. In this recipe I also used Malt Powder to make it a bit more ‘Malteser’ like. I have put notes below however on how to include a tub of Malteser Spread! 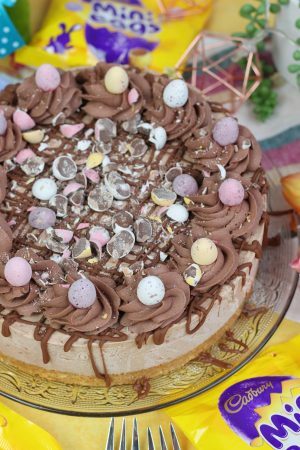 I recently re-made my No-Bake Chocolate Malteser Cheesecake and it was such a massive hit, along with my Malteser Cake, so I know you will all love this. Maltesers are a bit of a weird one for me, because I could easily eat another chocolate bar instead, but when I open a bag/box/anything of Maltesers, the box can easily just vanish into my stomach without me realising. They’re so moreish! This way, you get to enjoy Maltesers, without eat the whole batch in one. 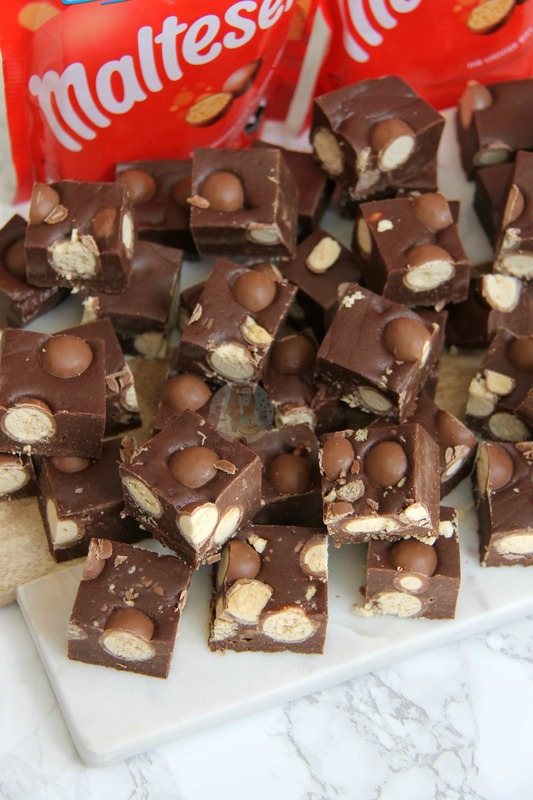 You can easily swap the maltesers to whatever you like, and take out the Malt Powder if you wished. However, I love this fudge so its perfect to me. If the Fudge is a little squishy still, or its not setting, its probably got too hot, so you could try freezing it. Or, what I have done in the past is melt it back down and add 600ml of double cream, whip it together and make ice cream! Its heavenly. I hope you like this recipe as much as I did! The Maltesers that are on the outsides that are cut into, do sort of hollow out after a while, but any that haven’t been cut will stay fine till eating! 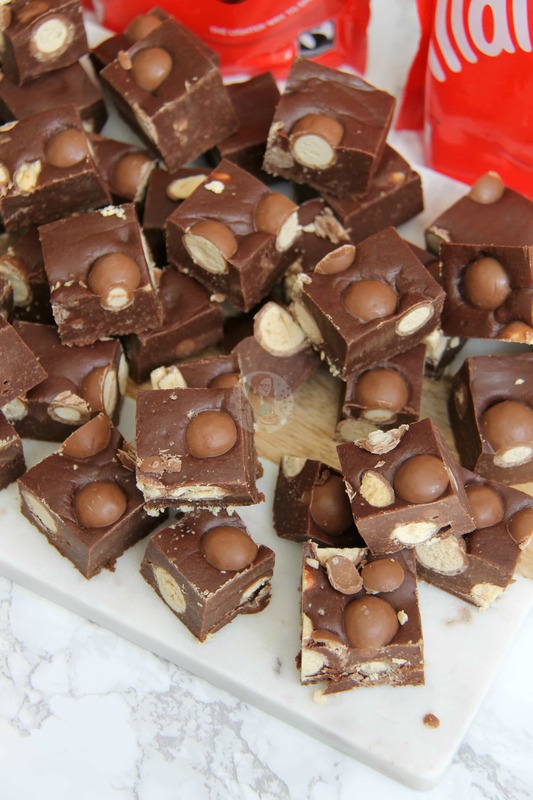 I tend to cut quite small pieces as fudge is naturally sweet, but you can easily make fudge slabs! 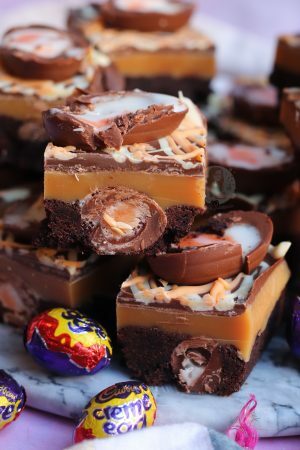 You could use a fudge mix to top off brownies, or a rocky road for example… anything with fudge is DELICIOUS. Enjoy! Once melted, tip in the Malt Powder and sifted icing sugar and combine well, it might take a bit of beating, but its worth it! Fold through one or two of the bags of Maltesers, or more if you fancy, and then pour into the tin and smooth over the mixture. 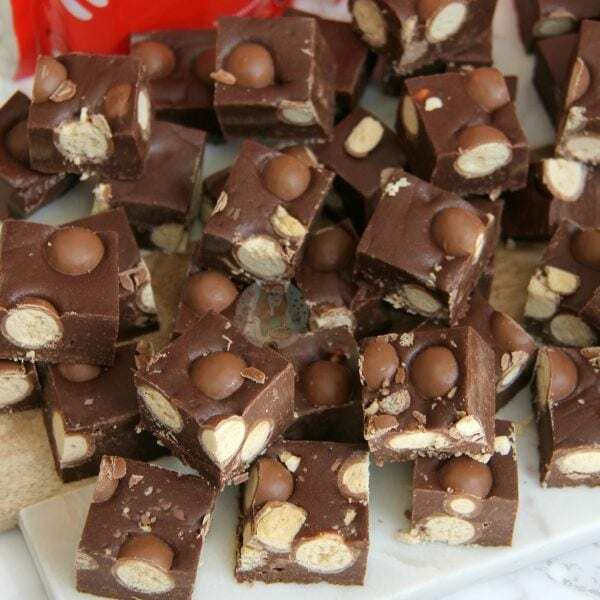 Sprinkle on the other bag of Maltesers and press into the top of the fudge and store in the fridge for at least 5-6 hours (Or preferably overnight) to set! 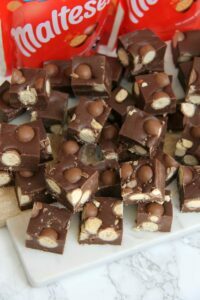 You can use the Maltesers Spread which I have used in a couple of recipe, but I would only use one per batch. Add it in, and take out 100g worth of either chocolate and mix it with the Chocolate & Condensed Milk in the pan. Find my other Sweets & Malteser Recipes on my Recipes Page! Older Next post: Mint Aero Cake! Newer Previous post: Cherry Bakewell Cheesecake! Just tried this today! Can’t wait to see what it turns out like as it’s my first time making fudge.. on the step where you beat in the malt powder and icing sugar, can you use a hand mixer or does it have to be done by hand? Many thanks and much love for you whole blog! I have made this a few times now but my malteaser s alway go chewie very fast any help? I’m afraid they will turn chewy as they’re being stored in the fridge. Usually the bits cut open from slicing the fudge go first, any that aren’t cut open last longer. This recipe is great and so easy to make – eve I can do it! I’m just starting to make my fourth batch in about 4 weeks! I haven’t eaten it all myself (haha) I’m putting it in a nice box and giving as a birthday present. Thank you for sharing the recipe ? Hi , can i ask is the malted powder easy to get hold of ? ive only ever seen it in form of a drink like malted milk powder which u add water to. Or can i buy from somewhere in specific in its own form? I live in uk if this helps. Yep, use that one. I use Horlicks which you add milk to ? It makes like a Malt Drink? Like Ovaltine, or Horlicks! this looks epic. I am trying to be good but I will definitely be trying this as a treat at some point.